“QIGONG CANNOT POSSIBLY BE LEARNED ONLINE!! !” he wrote. As I’m sure you already know, writing in all caps on the internet is the equivalent of screaming. But this person added 3 exclamation points, just in case I didn’t get his point. This comment came from a qigong teacher — one who doesn’t teach online, of course. After he screamed all over Facebook, I decided to message him privately rather than try to engage him in a public discussion. “Hey man, have you tried teaching online?” I asked. “So you haven’t tried?” I asked. “Qigong is an energy art that requires LIVE transmission,” he said, ignoring my question. At this point, the conversation degenerated. I tried to explain that you can teach live online, but it quickly became clear that Ken was not interested in having a discussion. Let’s just say that there were a lot of ALL CAPS in his messages. The truth is that I was like Ken at one point, minus the ALL CAPS. I thought, and even publicly stated, that qigong could only be reviewed via online teaching, not learned. I was wrong. Dead wrong. And I’m not afraid to admit it. I know I was wrong because I tested my theory. I tested it for years, using the latest online learning technology and methods. I experimented with live teleconferences, meditations that were recorded during a live event, live webinars, recorded videos, Facebook groups, guided meditations, and more. With each new experiment, it became clearer and clearer that teaching qigong online not only worked — it worked GREAT. In retrospect, I feel like an idiot for saying that qigong can’t be learned online. 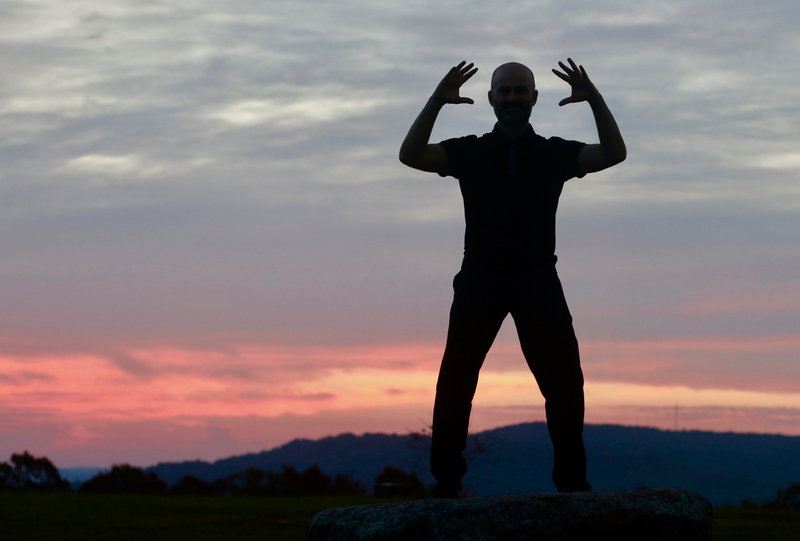 Qigong absolutely can be learned online — safely and effectively. That’s not to say that learning online is necessarily better than learning in person. They both have advantages and disadvantages. As of this writing, I’ve taught thousands of students online, and many of them have later come to learn from me in person where I was able to confirm their progress. With others, I’ve done live Skype calls or live webinars where I could see and hear them. And most importantly, I’ve gotten feedback from hundreds and hundreds of students from all over the world. Their message is clear: Online learning works. These days, when people say that online learning doesn’t work, I don’t bother to argue. Instead, I respond by sharing some of the comments I’ve received from students. I let their words settle the matter. After reading this post and these comments, I’m sure you can see that qigong absolutely can be learned online. And in fact, for some people, it’s the best option! What do you think? Have you tried to learn (or teach) qigong online? Let me know in the comments below! I have been learning and teaching online for some years now and it works wonderful. At the beginning I wasn’t sure if I could bring the ‘message’ through through virtual media. But when I saw the reaction and effects on people I have dropped all doubts. Very practical since neither the student nor the teacher loose time driving to the class, it takes place home after all. I am more available to any questions or doubts and the student doesn’t have to wait until next class. It is useful for busy people, or sick people who can’t get out so much, and you can reach the whole world. Hm….what you teach is some Qigong…..um….and actually a very small part of a very large and deep practice. What you teach online is what can be taught online. However certain concepts and practices have an absolute requirement for long in depth person to person exchanges. Um…like the kind you have experienced. You would not be who you are without those personal in depth teachings. I will paraphrase one of the teachings i learned. Sometimes teaching online is like explaining the moon as you point at it and everyone is looking at your finger. Keep up the good work. I notice that you posted this comment anonymously. Do you know what I do or don’t teach online? Have you taken all of my courses? Anyway, whether I teach advanced skills online or not is irrelevant. The point is that I can teach beginner and intermediate skills. Remember — I still teach in person too! I don’t know about the advanced skills. I may never become “advanced”. But I can say that by following and trying to apply what you are imparting, my life is changing in a wonderful way. I don’t know where my practice is going, but because of what I am learning and experiencing, I am determined to keep following and see where it takes me. Lead on! Perhaps some people get disturbed because they want to think of qigong as some kind of mysterious esoteric thing for the very few, who are in a closed insulated circle, and think of themselves as very special people. And then you come along and bust that wide open, and that really upsets their concept of being special. That is a sad psychological trait. They should be so happy that people are getting so much from your classes, and they should be grateful to you for the work you are doing. I know I am. I think you nailed it on the head, Ishan. I’ve seen the same phenomenon in the karate world, the yoga world, and the kung fu world.